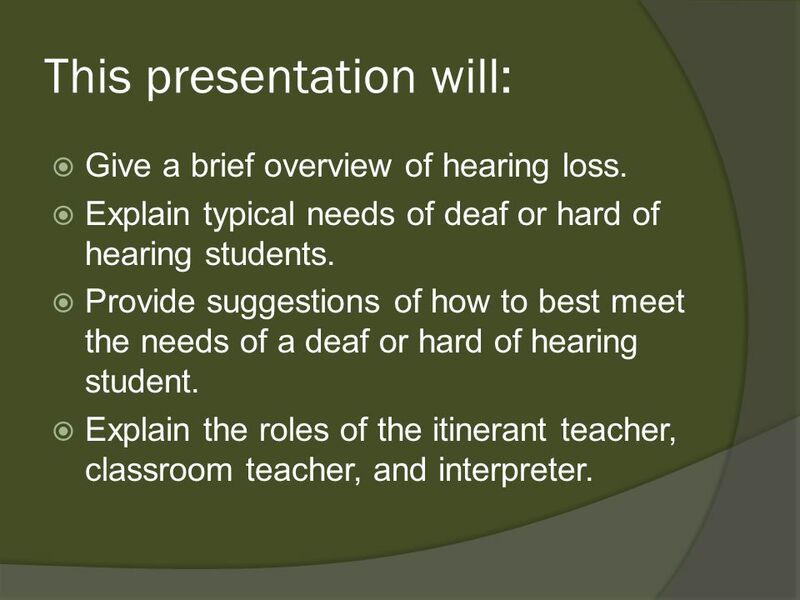 3 This presentation will:  Give a brief overview of hearing loss.  Explain typical needs of deaf or hard of hearing students.  Provide suggestions of how to best meet the needs of a deaf or hard of hearing student.  Explain the roles of the itinerant teacher, classroom teacher, and interpreter. 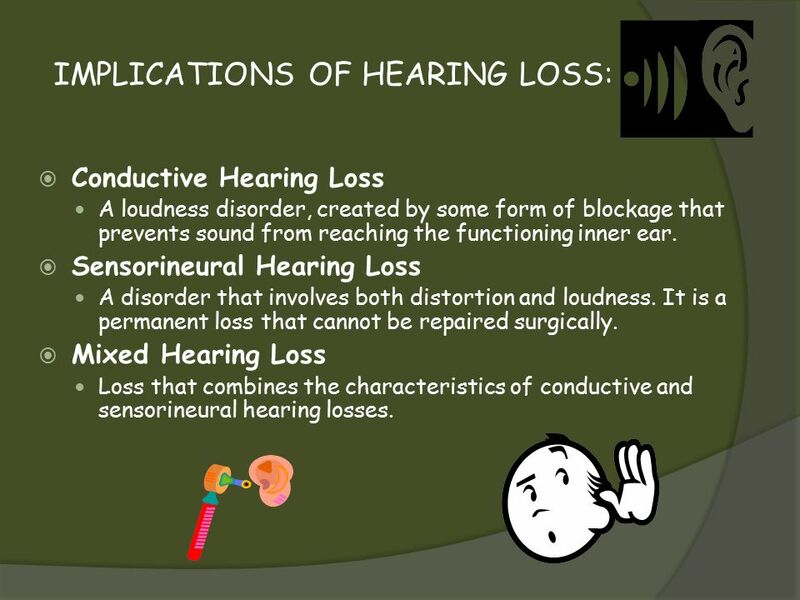 11 IMPLICATIONS OF HEARING LOSS:  Conductive Hearing Loss A loudness disorder, created by some form of blockage that prevents sound from reaching the functioning inner ear. 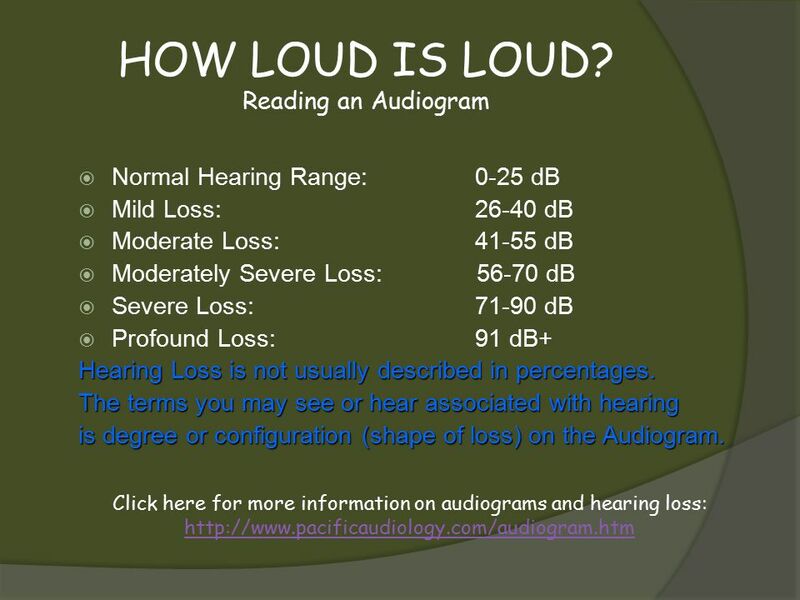  Sensorineural Hearing Loss A disorder that involves both distortion and loudness. It is a permanent loss that cannot be repaired surgically. 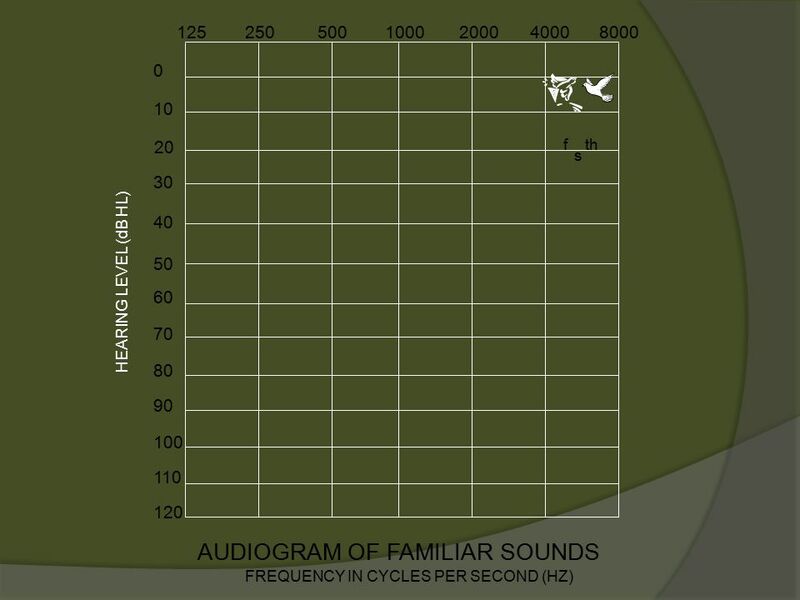  Mixed Hearing Loss Loss that combines the characteristics of conductive and sensorineural hearing losses. 17 You are not alone! 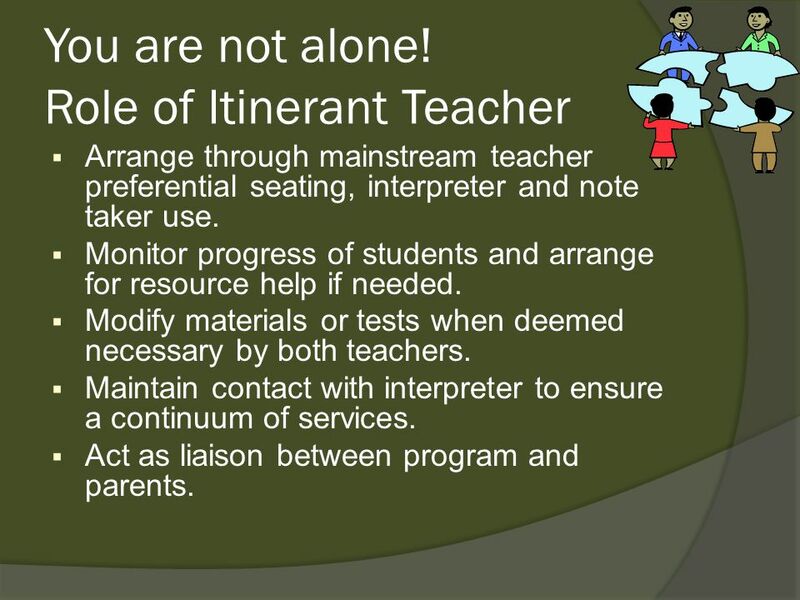 Role of Itinerant Teacher  Arrange through mainstream teacher preferential seating, interpreter and note taker use.  Monitor progress of students and arrange for resource help if needed.  Modify materials or tests when deemed necessary by both teachers.  Maintain contact with interpreter to ensure a continuum of services.  Act as liaison between program and parents. 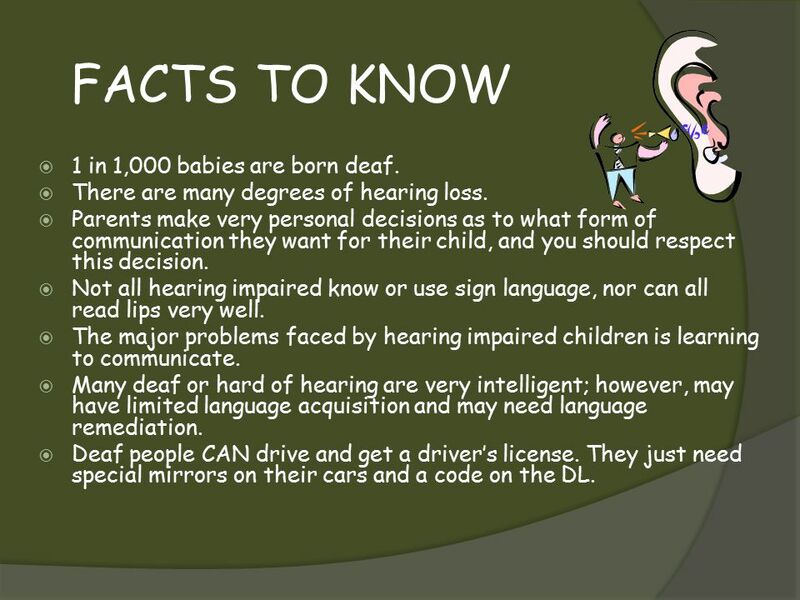 19 FACTS TO KNOW  1 in 1,000 babies are born deaf. 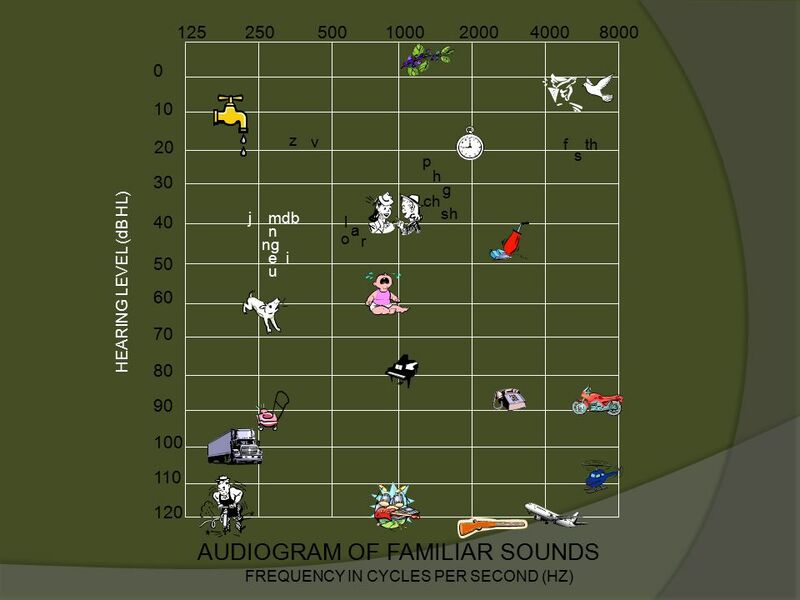  There are many degrees of hearing loss.  Parents make very personal decisions as to what form of communication they want for their child, and you should respect this decision.  Not all hearing impaired know or use sign language, nor can all read lips very well.  The major problems faced by hearing impaired children is learning to communicate.  Many deaf or hard of hearing are very intelligent; however, may have limited language acquisition and may need language remediation.  Deaf people CAN drive and get a driver’s license. They just need special mirrors on their cars and a code on the DL. 20 SUGGESTIONS FOR IN THE CLASSROOM: 1.Stand where the light will fall on your face -- this is much easier for speech reading. Avoid standing in front of a window or bright light. 2. 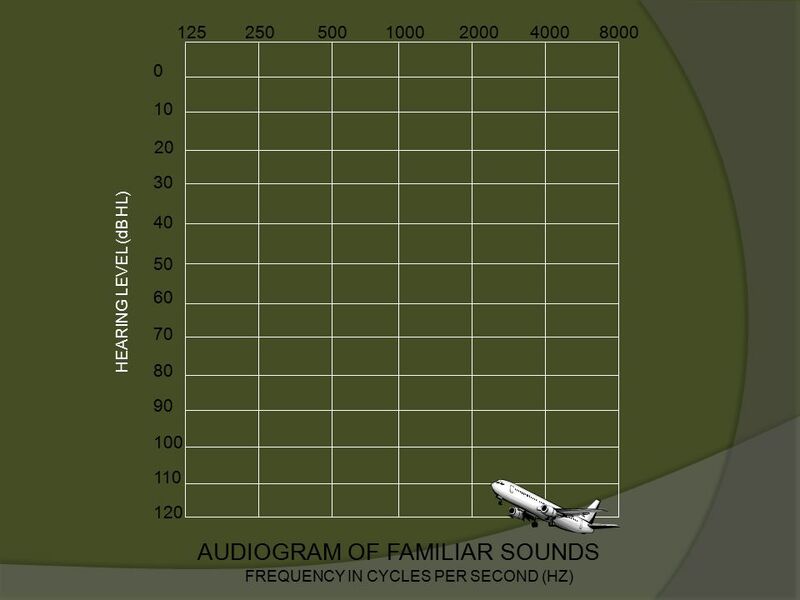 Keep general noise level down in the classroom. If a hearing aid is worn, it makes everything louder. 3. Supplementary pictures and diagrams should be used whenever possible. Make the work interesting. Use all the visual aids possible. Filmstrips and overhead projectors are particularly good. Using the captioning option found on all TV’s when showing video or watching television is essential. 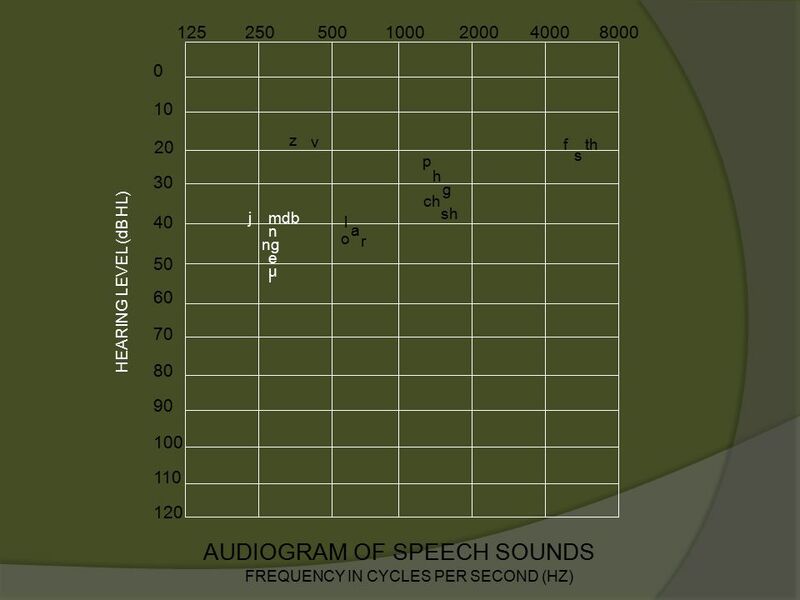 4.Students with hearing loss should be placed, for each teaching session, so there is a face to face visibility of the teacher’s speech movements. Encourage the students to watch the teacher’s face when the teacher is talking. 5.Students with hearing loss cannot take notes while they watch the face of the teacher or watch videos. 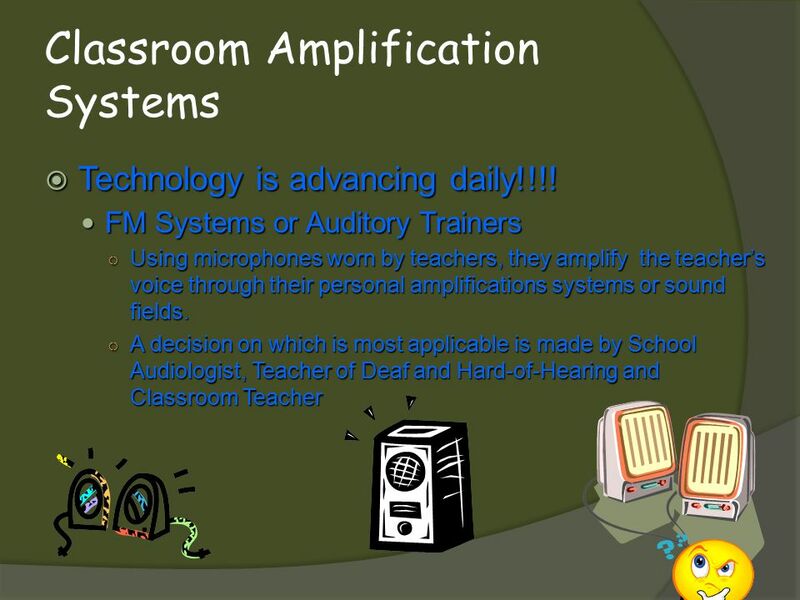 The best solution is for the teacher to provide their lecture notes or have a reliable, hearing student take notes to share with the deaf student. We have note-taker paper available. 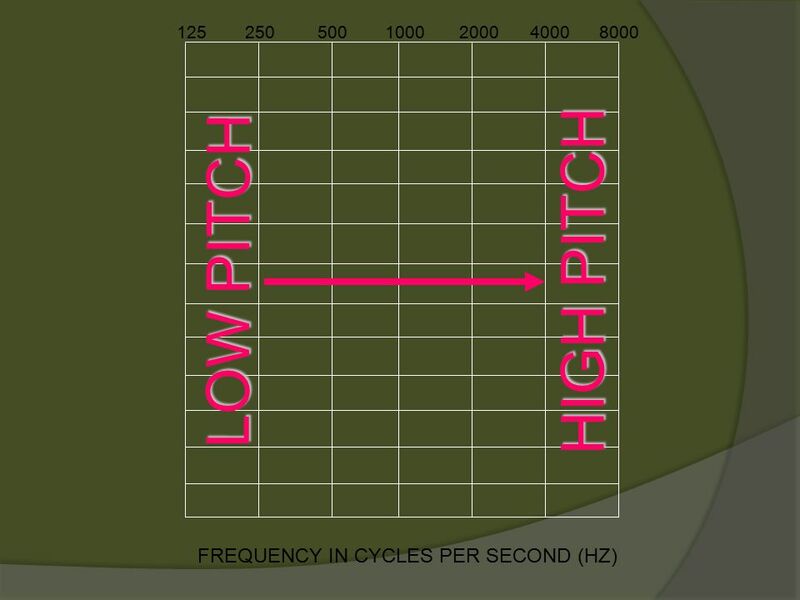 6.Use an FM or Soundfield System whenever possible. 21 1.Key words, expressions, phrases, new vocabulary and assignments should be written on the chalkboard as well as be explained orally. 2.Care should be taken not to talk with one’s face turned downward to read notes, turned toward the chalkboard, or when hidden by a book or hands. 3.Give opportunity for oral reports or presentations. 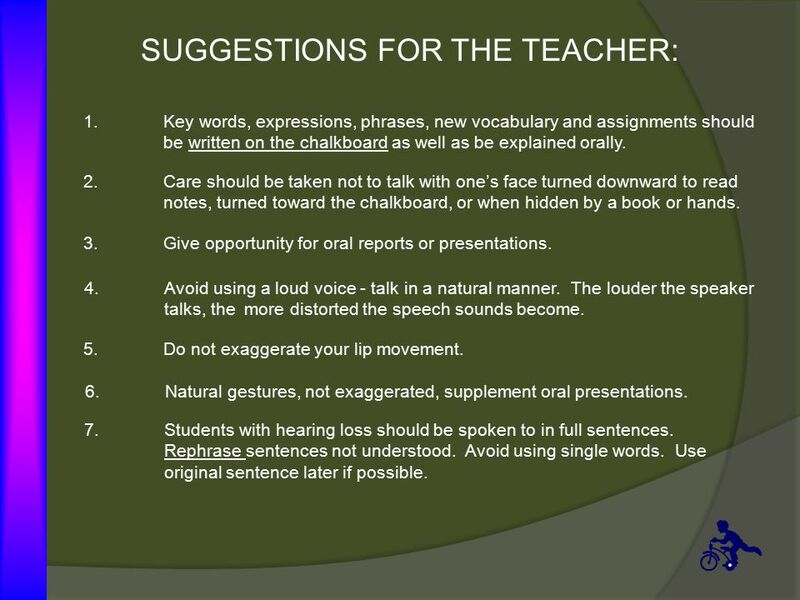 SUGGESTIONS FOR THE TEACHER: 4.Avoid using a loud voice - talk in a natural manner. 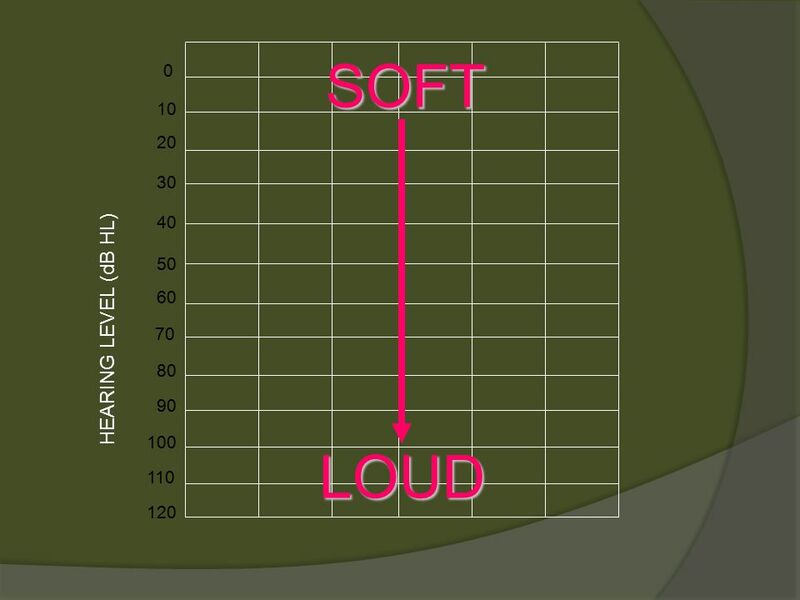 The louder the speaker talks, the more distorted the speech sounds become. 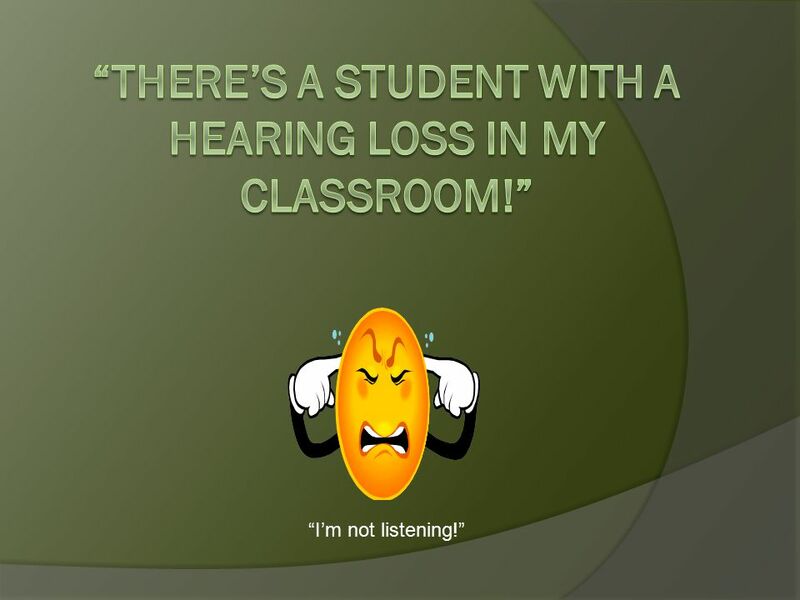 7.Students with hearing loss should be spoken to in full sentences. Rephrase sentences not understood. Avoid using single words. Use original sentence later if possible. 5.Do not exaggerate your lip movement. 6.Natural gestures, not exaggerated, supplement oral presentations. 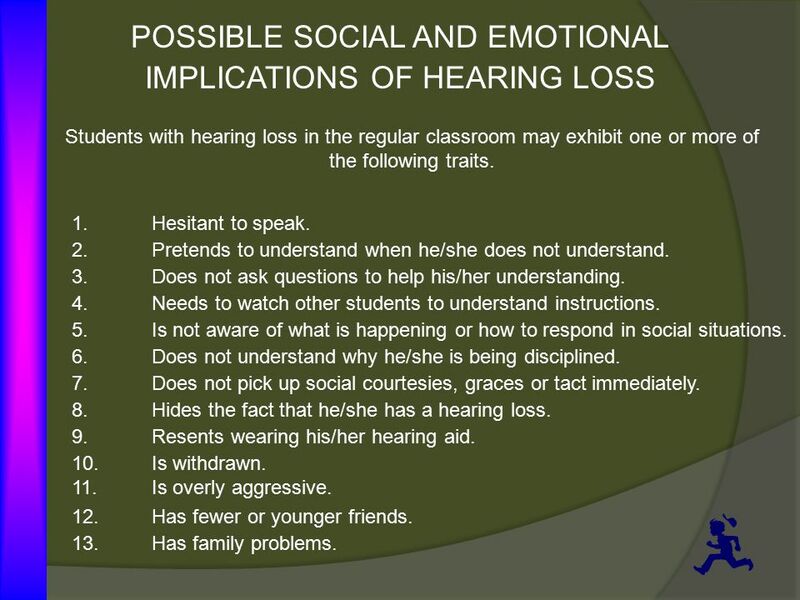 22 POSSIBLE SOCIAL AND EMOTIONAL IMPLICATIONS OF HEARING LOSS Students with hearing loss in the regular classroom may exhibit one or more of the following traits. 1.Hesitant to speak. 2.Pretends to understand when he/she does not understand. 3.Does not ask questions to help his/her understanding. 4.Needs to watch other students to understand instructions. 5.Is not aware of what is happening or how to respond in social situations. 6.Does not understand why he/she is being disciplined. 7.Does not pick up social courtesies, graces or tact immediately. 8.Hides the fact that he/she has a hearing loss. 9.Resents wearing his/her hearing aid. 10.Is withdrawn. 11.Is overly aggressive. 12.Has fewer or younger friends. 13.Has family problems. Download ppt "“I’m not listening!” This presentation will:  Give a brief overview of hearing loss.  Explain typical needs of deaf or hard of hearing students. "
March 2011 Department of Children & Families March 2011. 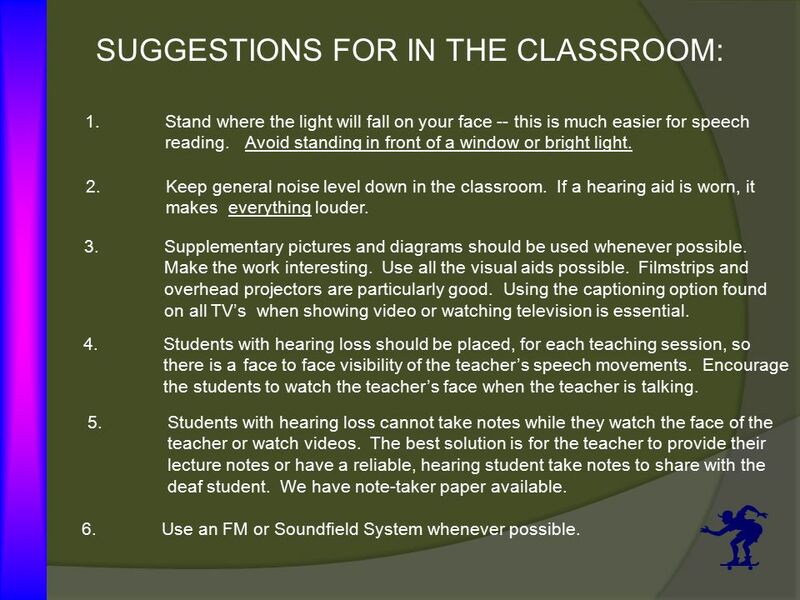 HEARING IMPAIRMENTS A GUIDE FOR STUDENTS AND FOR TEACHERS. By Eric Ryan EDU 410 November 18 th 2009. Number your paper from 1 to 10. 1 Hearing Services Program Department Revised July 2010 Building Inclusive Catholic Classrooms I will teach them to listen to Gods Voice; for it is everywhere. 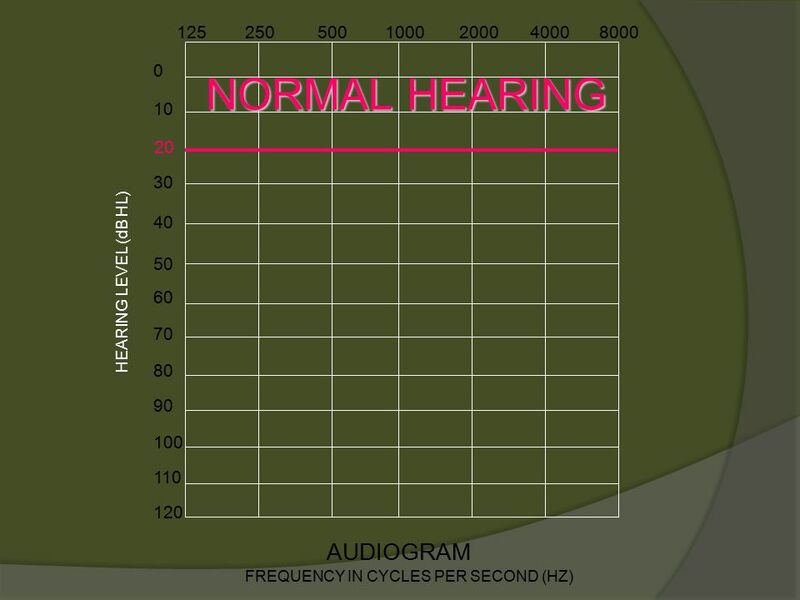 1  All students in grades K, 1, 2, 3, 6, 9, ungraded, all newly admitted students, and all students referred are given hearing screenings by the school. What is it like to ‘hear’ a hand? You have to be deaf to understand. Created by Cindy Camp Jacksonville State University in conjunction with PEC. 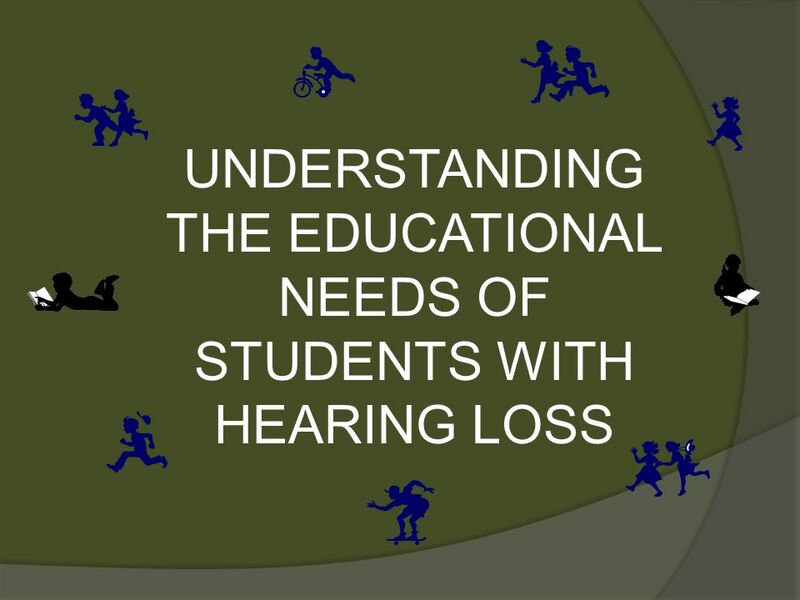 A presentation on the needs of having a young one with a hearing loss in your class. Working with the Hearing Impaired. 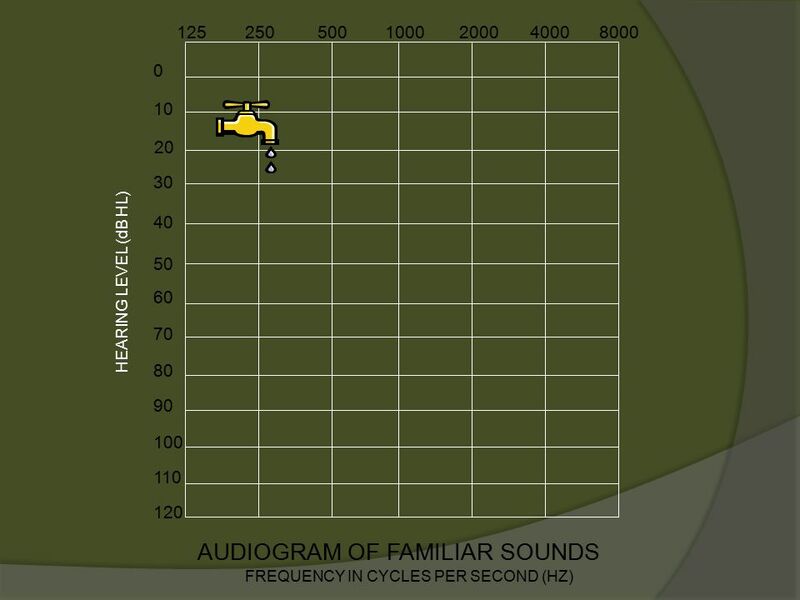 Topics of Discussion What is hearing loss? 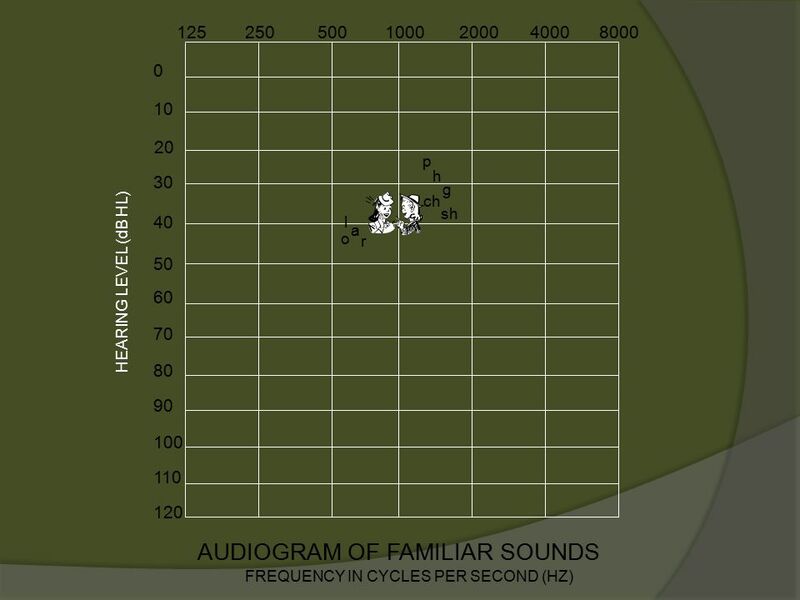 Decibels and fequencies Hearing Test Impact of hearing loss in the classroom. 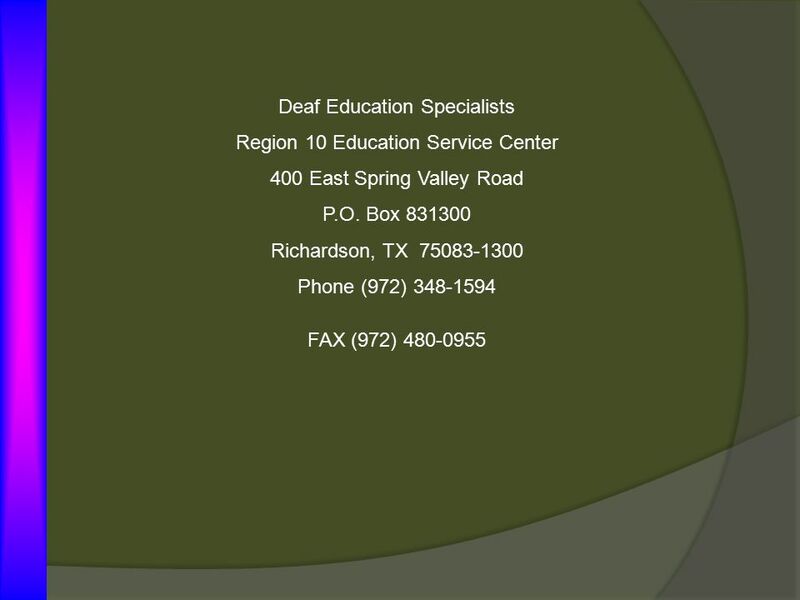 HEARING LOSS In Collaboration with Linda Thibodeau Jack Scott III Paul Dybala University of Texas at Dallas Region 10 Education Service Center P.O. Box.